Diet is an important indicator of health in life. Make sure your child gets off to the right start by providing nutritious meals and snacks and following the nutrition guidelines that are appropriate for your child's age. And if you think that food is just for the body, then you might want to take a look at Eating to Learn, which explains how food fuels the brain too. Many families these days are operating on the run, but never fear! We've got some ideas for healthy snacks so that no matter how little time you have, you're not compromising your child's intake of important nutrients. Food and nutrition is increasingly important these days. Kids are lured by advertising to buy all sorts of goodies that do them no good. 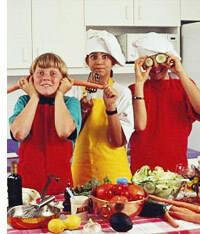 Combat this with your home-cooking; make it nutritious and flavorful to keep your kid's interested. Plus, regular home cooked meals can help promote healthy eating habits. And don't forget that limiting your child's intake of fast foods and other unhealthy foods is a great way to control your child's intake of cholesterol. Studies have shown that kids who eat healthy meals at home are more likely to choose healthy snacks outside the home. That means saying 'no' to greasy chips and sugary candies. This is important when it comes to school lunches. Whether your child is brown bagging it or buying, giving your child the space to make the right food choices and showing them how to shop for healthy food can help them feel more independant. Another reason to make sure that the food your children are eating is healthy: the wrong foods can make your child ill. Find out if your child is at risk in Is Your Child's Diet Making Her Sick? And don't forget about the importance of healthy portion sizes in order to keep your child physically fit. There are so many minerals and vitamins that children need. One of the most vital minerals is calcium. Calcium not only helps your child develop strong bones and teeth, it can also help ward off future ailments, like osteoporosis. To learn more about calcium, and how much calcium your child needs everyday, take a look at Why Calcium is Important. And if your child has a gluten allergy (celiac disease), rest assured that there are a variety of options from which to choose so that she can have the well-balanced diet she needs in order to grow at a healthy rate. Despite their age, studies have found that children as young as 6 and 7 are already concerned about being "fat" and understand what it means to diet. Learning more about eating disorders can help you recognize the signs and know what to do if you suspect your child may have an eating disorder. Has your child decided to give up meat? Don't worry if your child is trying out a vegetarian diet - it can actually be quite healthy! But there are some nutrients that may be harder to include, so take a look at Becoming Vegetarian and learn about how to help your child adjust to a vegetarian diet. Our Vegetarianism and Nutrition section provides an overview of nutritional information about different types of vegetarian diets. Can a Diet Make You Sick?